In the previous post I mentioned that I provided some training for my son’s kindergarten teacher before school actually got started. Not only did it give me peace of mind, but I think it helped calm her fears as well. I also mentioned that I gave her a dvd (Alexander the Elephant Goes to School), and she made a point to play it the first day of class. The dvd is only about ten minutes long- perfect for wiggly little 5 year olds. After the dvd there was a little time for discussion and for Little R to show his medic alert bracelet. School has been in session now for a little over one week, and so far there have already been two birthday sesons where treats were sent in. I provided a little bin of safe treats for Little R so he could choose something on these particular days. Mrs. M told me that just the other day while they were all enjoying some cookies that were sent in, one of the children said, “Hey, why does he get a box of Nerds to eat?? ?” Little R quickly replied, “I picked them out of my bin.” Another little child, a girl I think, chimed in, “Remember the Elephant?” I can picture them now 🙂 I am glad Mrs. M was there to witness it. 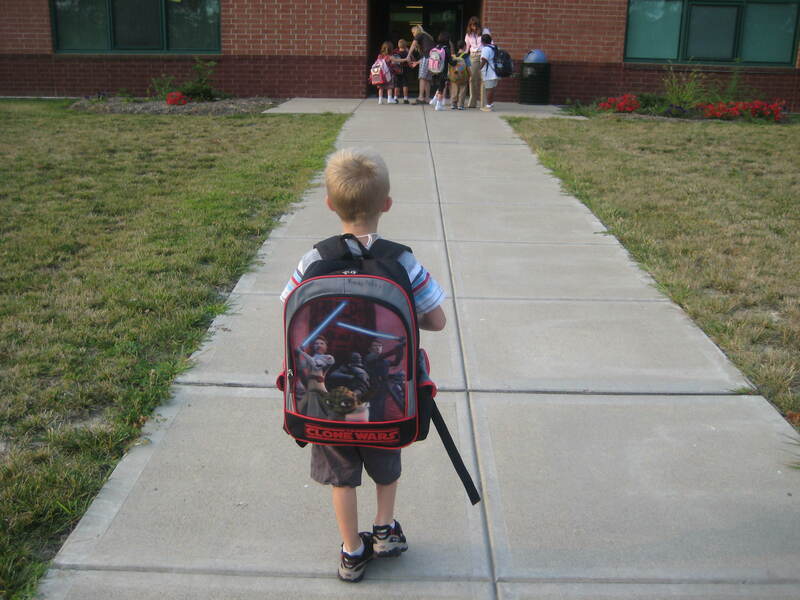 Sending your little food allergy child off to school, especially for the first time is one of the most scary things for their parents. At least, this is how I feel! Many of you know that for the past year or so we have been planning to home school due to food allergies. As this school year approached, I started feeling compelled to look into our school. It was one of those things where you just have a feeling about something and have to explore it. Little R was due to start kindergarten, and I had about three weeks to make up my mind. I have to say that I spent tons of time and quite a bit of money planning on homeschooling. I grew quite fond of the idea as I got deeper into it. As the deadline approached, however, I decided to make a visit to our local school just to explore the idea. I mainly wanted to see how they handle the situation of food allergies. I have to say that I was almost unable to believe how wonderful the school was from the start! From the first phone call I made to the principal, to the personal call I recieved from Little R’s teacher yesterday regarding a food allergy situation, the school seems to be 100% on top of the situation. So, yes, off he goes……. Since he is with his teacher, who I will call Mrs. M, the entire time he is at school, the majority of the weight falls on her shoulders. I wish I could post a picture of her here and offer her more official praise, but I am sure you understand the annonymity we wish to keep. The first day of school Mrs. M set aside time for the class to watch a dvd, Alexander the Elephant Goes to School, followed by a question answer time. Little R then got to show everyone his Medic Alertbracelet. He had expressed concern to me a few days before school started about what the other kids would think of his bracelet. He felt great about watching the dvd and having the teacher talk about it in class. Mrs. M carries both of his Epi-Pens around her waist in a carrier I provided. I even took in some expired Epi-Pens a few days before school started for her to practice. Probably the biggest tear jerker of all is that when his teacher found out I was going to a food allergy meeting with FAAST concerning back to school, she asked if she could attend with me! Now that is going above the call of duty as far as I am concerned. First and foremost, I have to apologize for my long absence. We have had a long and busy summer. I will not go into details here as it has nothing to do with food allergies. If you are not new to my blog, you have probably figured out that I have made some changes. I felt like my blog address should match up with my blog title. I was also unhappy with some of how I had everything organizes. Hopefully my food allergy blog will feel “cleaned up” so to speak. I look forward to getting back in the game. I sometimes get overwhelmed with things while I am reading about food allergies. Those of you living this life know exactly what I am talking about. 2007 was filled with many things, but my focus here is on our food allergy journey. I wish to thank ALL of you for taking the time to read our blog and occassionally leave your comments. You have no idea how much it means to us! The number one goal of this blog is to help communicate allergy news with our friends and family, mainly to help keep Randy and Carson* safe from the deadly food allergy reactions that are possible in the event of contact or ingestion of their food allergens. If it helps to educated a few others on the way; an added bonus! I am a little late in writing this post. This past Sunday night my husband and I feel we have made a new discovery. After dinner we let the boys have some homeade ice cream. We had some sprinkles in the pantry in which they must have when they eat ice cream. Anyway, to make a long story short, immediately after eating their desert, Randy started bouncing off the walls! This event immediately got my wheels turning. I had just recently read a thread on KWFA about food dyes and how they can cause reactions. Reactions from food dyes can cause different things like GI distress, skin problems (eczema), and even anaphylaxis! But, red dye in particular seems to cause hyperactivity in some individuals. This is what we think it does to Randy! We started reminiscing on times like when he ate some fruit snacks and he had the same crazy behavior. I got online to look up ingredients, and low and behold, the common denominator: Red dye #40! Now, I realize that it is probably a bit early to start jumping to conclusions. We will just have to keep our eyes and minds open to what he is eating and what his behavior is. But, my gut instinct is saying it is the dye! I would love to hear what you know about this topic.